Breed Survey: General Impression: A youthful dog of medium size, ideal type and temperament, strong pigmentation, correct dentition, correct Angulation. Sound running gear, sound of movement as viewed from all angles. Still a trifle lacking in spring of rib. Physical Characteristics (standing) Height: 25 5/8 inches. Weight: 82 lbs. Depth: 12 inches. Chest Circumference: 32 inches. Typy, medium size, dry, well muscled. Presently light in flesh. Trifle more spring of rib desired. Topline: High withers, iron back with long well formed croup. Clean neck. Fore and Rear Legs: Straight, parallel. Strong properly sprung pasterns, well formed feet. Chest and Fore Chest: Chest well developed, deep. Temperament: Test I: Normal. Test II: Normal. Test III: Normal. Observations After Tests: Confident, alert, good natured. Head and Expression: Head: Well chiseled. Ears: Well placed, well formed. Eyes: Well placed, well formed, medium. Teeth: Full dentition. Correct bite. Jaws: Sufficiently strong. Angulation: Rear Angulation: Well angulated. Should Angulation: Well placed and well laid back. Gait: Side Gait: Outreaching front and rear, buoyant, travels with high withers. Front Gait: True coming. Rear Gait: Legs, hocks and feet parallel. Breeding Recommendations: Recommended for improvement of general type, back and Angulation. ~ Grant Mann; January 16, 1961, Detroit, Michigan. 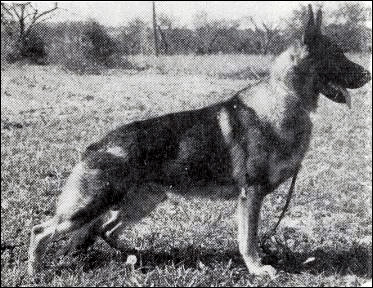 "Mary Southcott started breeding German Shepherds in the forties. She purchased Elbourne's Elga in 1948. She bred many litters, breeding to some of the best dogs of the time in North America, some were imports, some American Breds. She started of as a dog trainer then an obedience judge, then judging German Shepherd Specialties. Through the Specialties she attended she got to see the best. All of her breedings had a stamp of quality in the pedigrees and as I look over these pedigrees I wonder why there were not more great ones. Before she died she left me with her boxes of pedigrees. Champion Elbourne's Elga, seems to be one of her first.... In what became a pattern with Mary she bred Elga to the 1947 Canadian Grand Victor Ch Valiant of Draham. This not only took her into more Pfeffer, but also gave her that extra combination to Odin Von Busecker Schloss. Christine of Cara Mia came from that breeding and Mary bred her to Canadian Grand Victor Ch Vali von Sieghaus. This added a lot of Odin von Stolzenfels blood through Baldur von Befrieungsplatz and Arry von der Gassenquelle. There were also more lines to Nestor von Wiegerfelsen. Mary bred her to Canadian Grand Victor Ero von Awallenberg that on the mother side had similar breeding to Vali and added the Axel influence. This combination gave birth to Ch Rocket of Cara Mia and Ch Rita of Cara Mia. Rita went to the East coast and Rocket was eventually sold to Harry Watson, Owner of Ero, for who he did a lot of winning. His line breeding is shown as Uda von Maschtor 3 - 4. She was by Arry von Gassenquelle, now we had all the fine German dogs combining as the main influence; except there was still no R litter, Billo or Hein. Rocket's potential as a stud dog never was realized but there was one trickle of significance.... Rocket was a most impressive dog that was eventually purchased by Harry Watson. Although very correct he was not an outstanding mover. "